Abu Dhabi-based Ahalia Group has announced plans to set up a multi-specialty hospital, its first in Sharjah, in partnership with the Sharjah Healthcare City Authority (SHCC) at an investment of $100 million. Located conveniently between two major highways Sheikh Mohammed Bin Zayed Road and Emirates Road on the main Al Dhaid Road, the SHCC is well connected to all the emirates as well as the rest of the city. The construction of the healthcare city, is expected to be completed in several phases. Work on the clinical building and healthcare offices spread over 10,000 sq m is scheduled to start after summer. The 120-bed facility, which will come up on a 50,000-sq-m area, is the very first Ahalia hospital to set its footprint within the mega healthcare city. The announcement comes following last year's agreement between Ahalia Group and SHCC, which paved way for the development of the hospital on the Al Rahmania side of the healthcare city, said a statement from SHCC. Furthermore, based on the ambitious growth plans and global investor interest in the project, SHCC’s master development will now double its area to 4.8 million sq m from the previously stated 2.4 million sq m to accommodate several global hospitals and other related organisations, it added. Abdulla Ali Al Mahyan, the chairman of SHCC, said: "We are delighted to open doors to Ahalia and we are proud of the fact, that the brand has originated out of the the UAE. Futhermore, I am happy to announce that the SHCC plans have nearly doubled, ensuring that we are able to provide people with the best possible medical treatment that technology has to offer." "The extended healthcare city will now provide state-of-the-art medical services to rival those found anywhere in the world and position the Emirate as one of the top medical tourism destinations," he added. 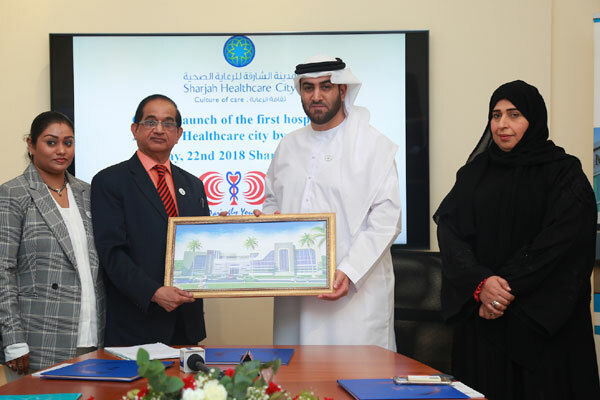 Dr VS Gopal, the managing director of Ahalia Group of Hospitals, said: "Our partnership here with SHCC is due to a mutual respect and admiration of what they are trying to achieve. We aim to be able to fulfil the healthcare requirements in Sharjah by utilizing the best industry practices, with the help of the latest technology in the hands of some of the world’s the best healthcare professionals." The aim is to start the construction by end of this year, he added. SHCC said as part of the updated plan, a state-of-the-art medical logisitics zone will be created within the heathcare city. Transporting medical and pharmaceutical supplies is a critical industry due to its specific and demanding nature. Due to its proximity to the airport, the SHCC proves to be an apt location for a medical logistics hub, it added.